Code Inside Blog | Change the WebDeploy Port or why do I need port 8172? Change the WebDeploy Port or why do I need port 8172? If you use WebDeploy on a server operation system you would usually use Port 8172. But what is this Port for and can I change it? Hint: For installing the WebDeploy I recommend this Blogpost. 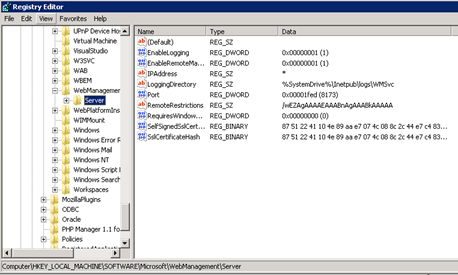 The Port 8172 is the default port of the IIS Management Service which is only available for server operation systems (so don’t worry if you can’t find it in IIS at Windows 7/8). You can change the settings on GUI (or Powershell) while the service is not running. I’ve already mentioned that the Web Management Service only runs on Server operations systems – so how does the WebDeploy work on my local IIS? WebDeploy on the server works always in cooperation with the Web Management Service – if you change the Port of the WMSvc dealer you change the Port for the WebDeploy. Background-Information: Where are those settings saved? 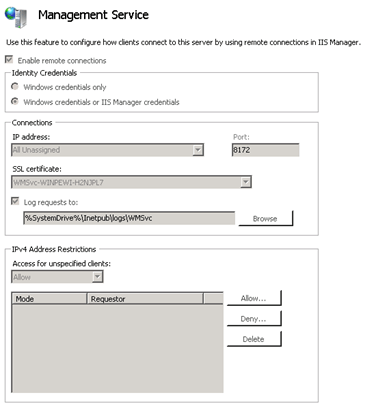 Go to Management Service with IIS Manager on a server and change the Port. WebDeploy uses the Management Service for the Deployment – also the Management Service is responsible for the “Remote-administration”.